The Girard football team was named the Craw-Kan Team of the Week. 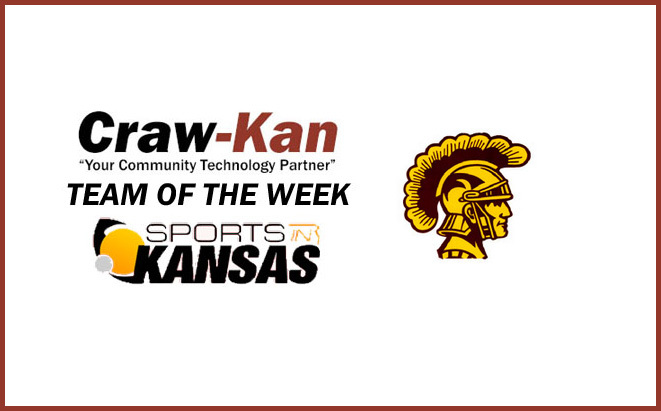 The Girard Trojans football squad was named this weeks "Craw-Kan Team of the Week" for their 57-13 victory over Baxter Springs on Friday night in week three of the football season. "It was a good team effort and we executed very well." Girard head coach, Leon Miller said. Friday night marked the first win for the 4A-II Trojans in 2014, after opening up with losses to Riverton and Galena in the first two weeks of the season. In Fridays match-up, Girard jumped out to a 21-0 lead on Baxter Springs after the first quarter with touchdowns by Trey Eaton, Tyler Green and Noe Guzman. Two more touchdowns in the the second quarter by the Trojans gave them a 35-0 halftime lead over the Lions, before cruising to a 57-13 victory. Girard (1-2) will have a big task this week as they take on fellow CNC member, 4A-II #2 ranked Columbus. The Trojans fell 26-7 in last years matchup at Columbus, and won 19-14 two years ago when the Titans first joined the CNC. Despite the 1-2 start in the brutal CNC League, Girard is still considered to be a favorite in their 4A-II district with Anderson County (1-2), Burlington (1-2) and Iola (0-3).